1. Friendly Door Mat – Nothing says “Welcome” more than a friendly first impression! If you like the idea of putting your last name or a custom design on your door mat, then check out this tutorial for a DIY door mat at Old Blue Silo blog. It’s really easy! 2. 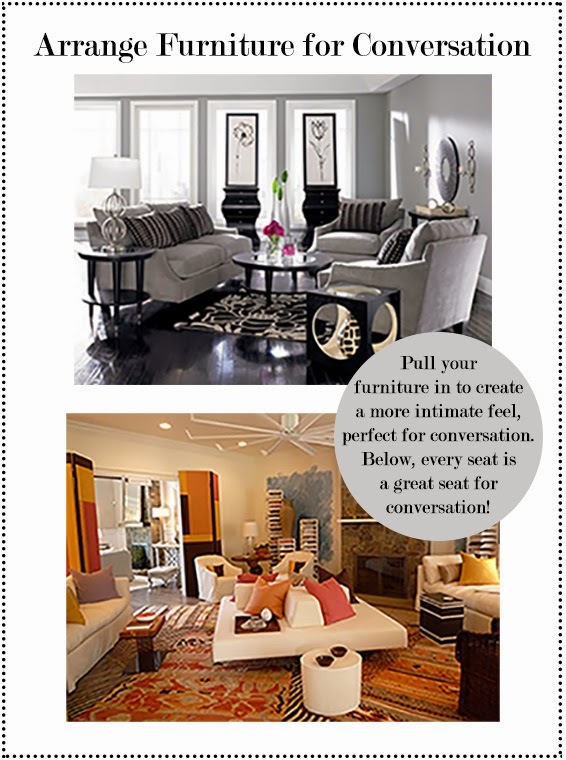 Arrange Furniture for Conversation – Don’t feel like you have to have all of your furniture against the wall. Pulling the furniture in creates a more intimate conversation space. Also, having seating in the middle of a room like in the photo, allows every seat in the room to be a great seat for conversation! 3. Freshly Fluffed Sofa & Pillows – If you have a saggy sofa you’ll be glad to know there is a very easy DIY method for breathing fresh life into your saggy sofa cushions and the supplies are only $10. You can find an easy tutorial here on the Living Rich on Less blog. 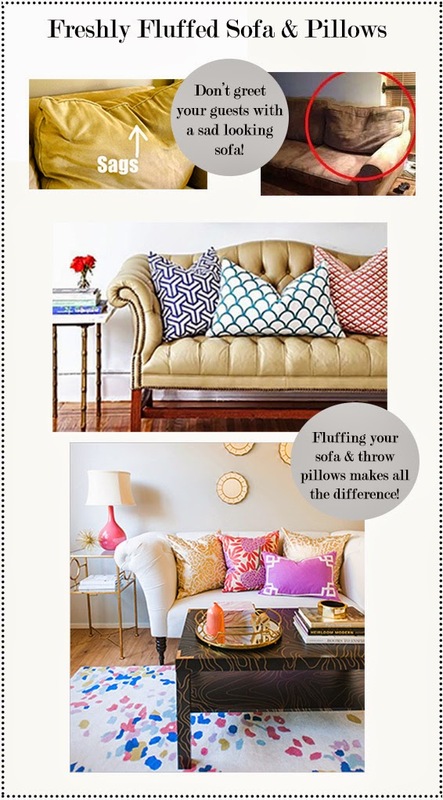 Visit Decoist blog for tips on the art of pillow placement! 4. Welcoming Scent – Your guest won’t be disappointed with the scents I’ve suggested! The Henri Bendel “Fig” reed diffuser and the Circle E. Candles “Bird of Paradise” candle. 5. Resort Feel – Having fruit infused water available or a fresh glass of lemonade is a wonderful way to welcome your guest. 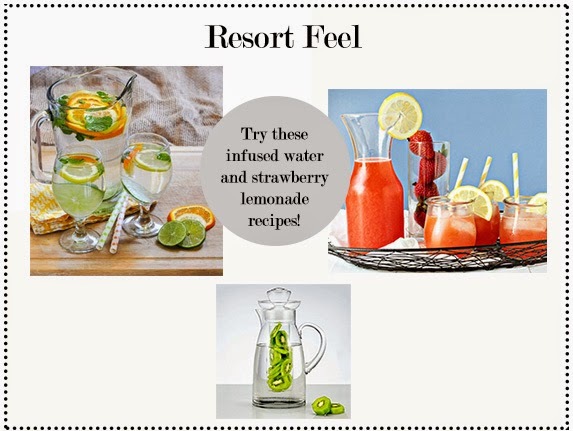 Try this recipe for infused water and this recipe for strawberry lemonade the next time you have a visitor stop by. Absolutely refreshing, just like at the resort! 6. Engage Your Guest – With interesting coffee table books and curiosities! This will ensure that people stay comfortable and engaged even if you have to step away for a moment. Here are two of my coffee table books: The Houses of Veranda and A Year of Festivals (A Lonely Planet Guide). 7. Fresh Flowers & Plants – Fresh flowers & plants are the easiest and most classic way to give your home a more inviting feel. 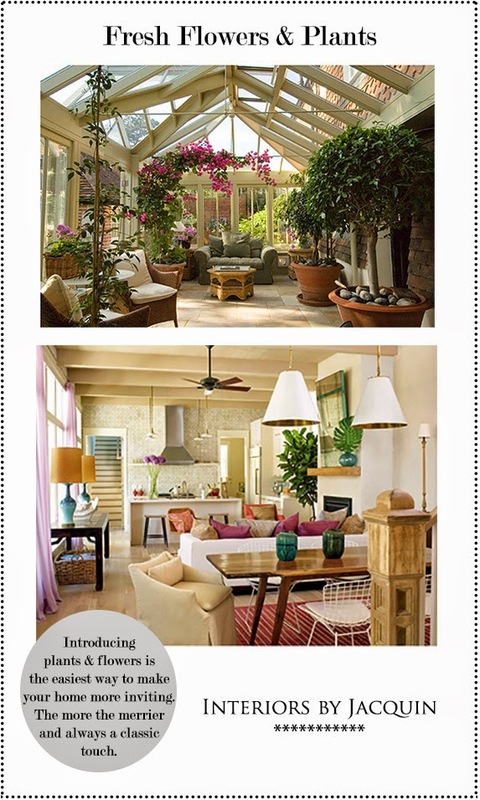 If you want to make sure your home always has this fresh look, try a large faux potted plants like this one.